After we had pedalled fora while, G-boy said he had to poo! We were in the middle of nowhere, but there were a few houses here and there, so I stopped at one, where a really friendly lady came out and asked if we needed help. We asked to use the bathroom, and she welcome us in. While we were getting ready to leave, Dan asked if there was any place to eat around there. She said, “Not really… I’ll make you lunch.” So we had this lovely spaghetti lunch with this super generous girl, and we were once again so amazed at how wonderful people are if you put yourself out there in the world. On the way to London, we stopped at a very nice playground in Beachville, home of the first recorded baseball game. The kids played and had fun, and we finally decided to get on the road again. It was so nice to have this nice officer help us out, and once our conversation was over, we got on the bikes and kept on going, finally making it to our destination in London, a bit cold, but still pretty happy. We arrived at my cousin’s house, where the kids were pretty happy to have other kids to play with. While we were in London, we attended my brother’s annual “Festa Junina,” hung out with my mom, dad, and stepmom, and had a good time with my cousin and his family. It was quite the trip, and we’re hooked. We’re already dreaming up our next adventure – hopefully a longer one this time. Stay tuned. And with the end of this post, I have finally finished writing out our journal posts about the cycling adventure. Only took me 7 months… I’ll do better next time; I promise! Yes, there will definitely be a next time. We don’t have a date or route yet, but we do have dreams. 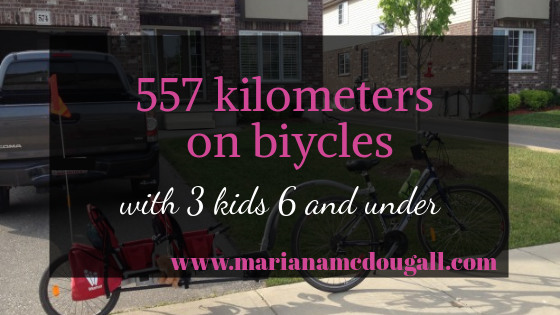 Would you ever bike tour with your kids? Where would you go?